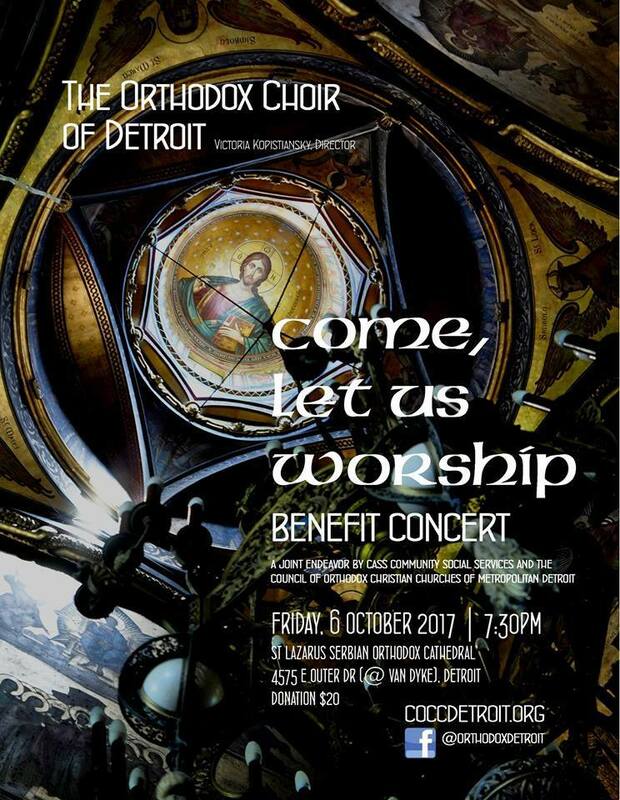 DETROIT, MI [COCC] -- The Orthodox Choir of Metropolitan Detroit will perform its seventh annual benefit concert on Friday, Oct. 6 at 7:30 p.m. at St. Lazarus Serbian Orthodox Cathedral, 4575 E. Outer Drive, 48234, at the northeast corner of Van Dyke Avenue. With the theme "Come Let Us Worship", the concert program will consist of hymns and liturgical songs from different Orthodox Christian traditions. The choir is composed of more than 40 volunteer singers from several Orthodox Christian parishes in southeastern Michigan. It is directed by Victoria Kopistiansky, choir director at Holy Trinity Orthodox Church, Detroit. Sponsored by the Council of Orthodox Christian Churches of Metropolitan Detroit (COCC), in partnership with Cass Community Social Services, the concert will support charitable endeavors provided across the region by the respective organizations. The concert is open to the public. Tickets are $20.00 in advance or at the door. For advance tickets, contact COCC President Olga Liskiwskyi at (248) 252-8184 or Olgaliss0910@gmail.com, or call St. Lazarus Serbian Orthodox Cathedral at (313) 893-6025.